Do we have Evil Counter-parts Living in Alternate Universes? 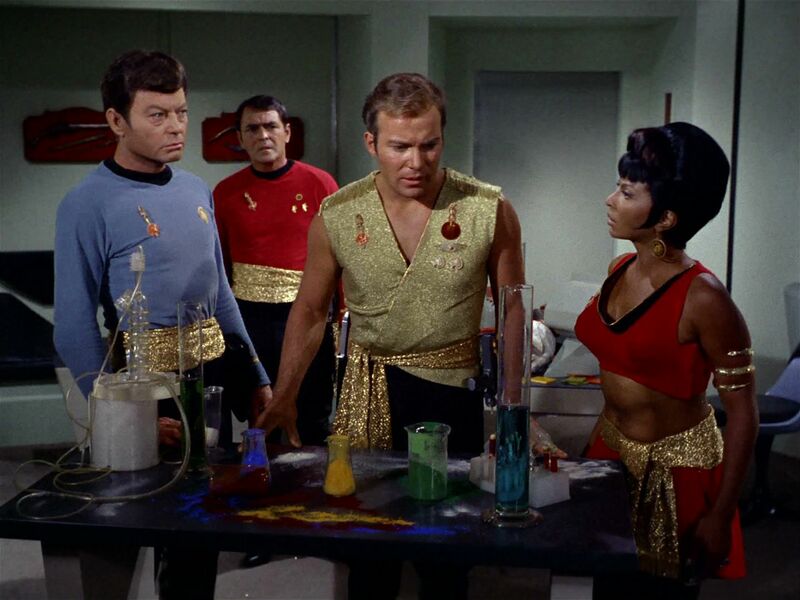 The original Star Trek television series (featuring William Shatner as Captain James T. Kirk and Leonard Nimoy as Commander Spock) introduced Americans unaccustomed to reading science fiction to a number of interesting conjectures. One of which played out in an episode entitled "Mirror, Mirror" where Kirk, McCoy, Scotty and Uhura were exchanged with their counterparts from an alternate universe. The universes were very similar in many respects, but in the alternate universe the United Federation of Planets is known as the Terran Empire and instead of being a force largely for good, the Terran Empire is barbaric and ruthless. Of course, the answer depends in part upon whether there are, in fact, multiple universes that exist. When I was doing a little reading for writing my two-part (perhaps, soon to be three-part) post on the Infinite Monkey Theorem, here and here, I found an article in Space.com on the Multiverse. It suggested what I have understood for awhile: if the multiverse theory is true and the Multiverse really is infinite, then it necessarily means that there will be multiple copies of us. [In] these billions upon billions of universes, Hawking is suggesting that there is one that is identical to ours except that Zayn stays in One Direction. In fact, this is consistent with the theory that there are multiple universes which are wholly identical with our own except that one decision was made differently. So, in one universe, Zayn leaves One Direction. In another, Zayn stays with One Direction. In a third, Zayn never joined One Direction. In a fourth, Zayne left One Direction two years ago but returned after spending two years as a driving instructor at Cheap Thrills Driving School in Sacramento. In a fifth, Zayn died in a horrible car accident three years ago, but in a sixth, Zayn survived the accident but lost both of his legs and One Direction turns into a group dedicated to supporting the rights of the disabled. The list goes on and on. Now, think about your own situation. If the version of the Multiverse being referenced (perhaps even promoted) by Hawking is correct, there are millions of you in existence. In one version of you, you went to a different college. In another version, you went to prison. In another version, you married your high school sweetheart, but in a fourth, you had a shotgun marriage with someone you didn’t care about. In still another, you are working as part of the crew of a travelling carnival. And despite their myriad of differences, all of these people are you existing in various alternatives of your life simultaneously. The problem is that if the multiverse exists at all and if it really is infinite, then it is mathematically true that all of these alternative Zayn Malik's (and alternate yous) do exist in other universes. And because the multiverse is intended to answer the very serious and very real problem of how life could have beaten the extremely long odds and arisen on our planet, the theory requires that the number of alternate universes really be infinite. Personally, I find this to be an absurd answer. There are multiple (but not infinite) reasons to disbelieve the multiverse theory, such as the absurdity of believing in an actual, physical infinite. Among the most compelling is that if violates our inner sense that we are not just one of many copies of ourselves - a intuition that is confirmed by the Bible. The Bible describes this as God having "knit me together in the womb." (Psalm 139:13) We are considered to be "fearfully and wonderfully made." (Psalm 139:14) Before God "formed us in the womb," and before we were born, God "knew us." These verse speak to God creating us as individuals - not some type of accident of the creation of bubbling of infinite universes out of infinite pools. So, it is possible that more than one universe exists - although we have no compelling evidence to believe more universes actually exist. (To paraphrase John Lennox: Just because the math makes us believe something is possible does not mean that it corresponds to reality. Thus, just because $5 plus $10 equals $15 does not mean that I have $15 in my wallet.) It is also possible, but less likely, that the multiple universes are infinite in number even though it may work in theory. But if the Bible's teaching is correct as I believe it to be, then even an infinite number of universes exist, there won't be an evil you because God made you unique right here for this universe. so somewhere out there there is probably a version of Skepie who is a fundamentalist Christian and a BK who is an atheist and they argue a lot. And a Metacrock who can spell. In some alternate universe there's a Joe Hinman who teaches at at Harvard. But if Craig is right the are no actual infinitives so no infinite multiverse. BK: This raises the question of whether it is possible that alternate universes exist like the Terran Empire where exact replicas of each of us exist, but the replicas are evil rather than good. No, because if he was evil, then he would not be me. I am what I am. If it was a world in which the intelligent beings were dogs, we would not try to identify the one that was the dog-version of us, because we could see at a glance that it was not us. Just because there is a physical similarity, it does not make that evil person the evil version of me. Also, no because the differences in what good and evil people do is so great that it is extremely unlikely that the evil versions of my parents will have got together to have children. Or their parents. Or their parents. BK: Scientists can't be sure what the shape of space-time is, but most likely, it's flat (as opposed to spherical or even donut-shape) and stretches out infinitely. But if space-time goes on forever, then it must start repeating at some point, because there are a finite number of ways particles can be arranged in space and time. I appreciate you are quoting a seemingly reasonable source, but this is not multiverse, it is a single, infinite universe. This is very important to appreciate, as it is the basis of your argument! BK: How different is that? The article suggests it could be as small as wearing different clothing, or as big as different careers/life choices. But that makes it sound as if you only chose to be a plumber rather than a banker, or a fashion designer instead of a bartender. But perhaps the alternate you in one of these alternative universes made the different life choice of becoming an evil dictator. There is a reason I became (say) a plumber, and if the other world is identical (so similar that after 4 billion years of possible divergences there is still a me in both) then those same reasons apply. Why would I then choose to be an evil dictator? BK: The problem is that if the multiverse exists at all and if it really is infinite, then it is mathematically true that all of these alternative Zayn Malik's (and alternate yous) do exist in other universes. No it is not. There is a reason why things happen, and a reason why others do not. There will be no universe (or rather, no region in this infinite universe) where Zayn suddenly became a unicorn. That does not happen, it is not possible. By the same token, I suggest that it is not possible that he would became a driving school instructor - given the circumstances of his life, it is not possible. BK: And because the multiverse is intended to answer the very serious and very real problem of how life could have beaten the extremely long odds and arisen on our planet, the theory requires that the number of alternate universes really be infinite. But your argument is actually directed against a single infinite universe, which is unfortunate, because that is what the evidence points towards.